The Everblades open up their 20th Anniversary Season at home this Friday (Oct. 13, 7:30 p.m.) and Saturday (Oct. 14, 7:00 p.m.) against the Atlanta Gladiators! Callum Booth stopped 26 of 27 shots in his professional debut to lead the Florida Everblades (2-0-0-0) to a 3-1 victory over the Atlanta Gladiators Saturday night at Germain Arena. 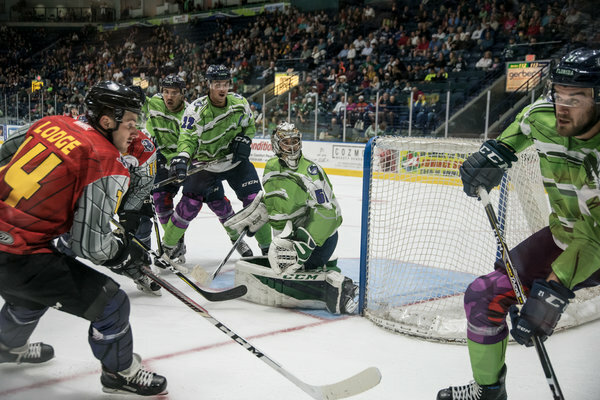 Nelson Armstrong, Clark Seymour, and Joe Cox each scored a goal to help lead the Florida Everblades to a 5-1 victory over the rival Atlanta Gladiators Saturday night at the Infinite Energy Arena. With the win, the Everblades (4-0-0-0, 8 pts) have now won each of their first four games this season. Checkers and Everblades with combined 9-2 record. ESTERO, FL – Matt Berry finished with a goal and an assist, while rookie Joe Cox scored the go-ahead goal in the third period to lift the Florida Everblades (5-0-0-0) to a 3-1 victory over the Indy Fuel (1-2-1-0) Wednesday evening at Germain Arena. Callum Booth takes the loss allowing three goals on 31 shots, while Anthony Peters earned the win in his return to Southwest Florida, making 36 stops on 39 shots faced. ESTERO, FL – Martin Ouellette made 27 saves to lead the Florida Everblades to a 3-1 victory over the Jacksonville Icemen Saturday night at Germain Arena. The Everblades (12-2-0-1) take both games of the weekend home-and-home set against Jacksonville. My eyes hurt just looking at that picture. I think those unis are really cool. The one notable prospect there, Booth, isn’t doing well. His save percentage is .88something and above 3 on GAA. Ouellet has played as many games as Booth. Anyone know what happened to Spencer Smallman? He was thought to end up in Charlotte but got sent down to Florida. There are stats for one pre-season game then...can't find him. Was he injured? Not listed on the roster of Florida or Charlotte. Still listed as in our system. ESTERO, FL – The Florida Everblades used four different goals scorers to defeat the Allen Americans 4-1 at Germain Arena Saturday night. The ‘Blades now extend their unbeaten streak to five games, and continue to the hold first place in the ECHL with 73 points. Interesting, but is there a reason? And what about Smallman that someone was inquiring about? Never mind, found gocanes0506 posted something on Smallman under Junior Hockey players, thanks gc0506. What was his injury anyway, and why so long to heal? Sorry, haven't kept up with him too closely.